Photo I.D. Badges: 2 1/8" x 3 3/8"
Your logo, photo and up to three lines of personalization are digitally printed on .030 heat laminated plastic so your imprint is totally protected and tamper-resistant. 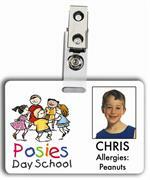 Prices range from $11.49 to $2.29 each and includes full-color on both sides of tag. Photo I.D. 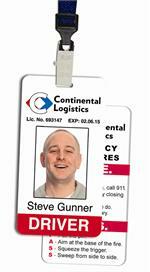 Badges: 2" x 3"
Your logo, photo and up to three lines of personalization are digitally printed on .030 heat laminated plastic so your imprint is totally protected and tamper-resistant. 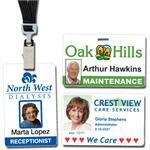 Prices range from $31.59 to $2.29 each and includes full-color on both sides of tag. Photo I.D. Badges: 1 1/4" x 3"
Your logo, photo and up to three lines of personalization are digitally printed on .030 heat laminated plastic so your imprint is totally protected and tamper-resistant. Prices range from $12.99 to $2.09 each and includes full-color on both sides of tag. Photo I.D. Badges: 1 1/2" x 3"
Photo I.D. Badges: 4 1/4" x 2 1/4"
Your logo, photo and up to three lines of personalization are digitally printed on .030 heat laminated plastic so your imprint is totally protected and tamper-resistant. Prices range from $13.99 to $2.59 each and includes full-color on both sides of tag.